OUR PRICE: $3.62 - Join Rewards Get $1 Dance Dollars On This Item! 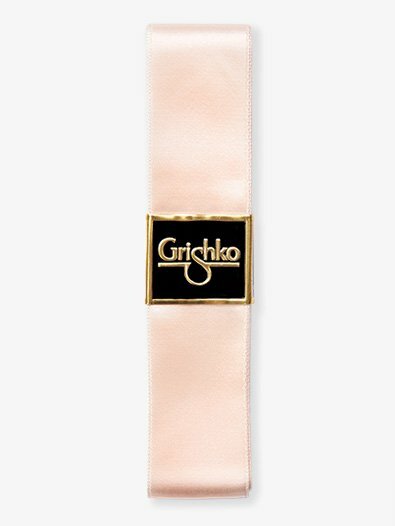 Grishko 1" wide ribbon. Light European Pink. I've used these ribbons with Gaynor Minden, Freed, and Russian Pointe shoes and they never disappoint! Super nice color and not too shiny. Perfect ribbon color -- pairs seamlessly colorwise with most pointe shoes (I use them with Bloch and Grisko brands.) I prefer these are not stretchy as it helps with the stability of the shoe during movement. I think this ribbon is really comfortable and the colour matches almost exactly with my Grishko Elite pointe shoes. It might be slightly too pink for Russian Pointe and too light for Capezio and Freeds but overall great ribbons! My daughter just sewed these ribbons on a new pair of pointe shoes yesterday. She wore them today only to have her picture taken, and already every end is unraveling. One end unraveled about 1/2"; at that rate, it won't be long until there isn't enough left to tie. The ribbon is also very thin - she noticed right away that you can see through it. I expected much higher quality. I had these ribbons, I hated them. When you tie them, the knot stays, but it gets very loose and doesn't support your ankle. The color is too pink for Russian Pointes, and is white on capezio and Grishko!!! My advice, save your money and buy other ribbons. These ribbons works with many shoes types and always look beautiful. They give you plenty for both shoes and they stay gleaming and almost wrinkle free after many wear. I caution you to burn the ends to stop the fraying, and to make sure you sew shiny side up. If the grainy side is up, (a mistake I'v made) it will look strange, like it is almost a different color. Finally, if performing with these tuck the ribbons good and give them a good shot of hair spray to stop slippage. I haven't found anything special about these ribbons. They're your typical ribbon, have one side shiny and one side matte, and need tended to on the ends so they don't fray. I fold the ends twice and sew them, and I've never had issues with fraying. I actually prefer using the matte side up (shiny against my tights) because I've found it gives me less slippage and a nicer look, personally. Great ribbons. 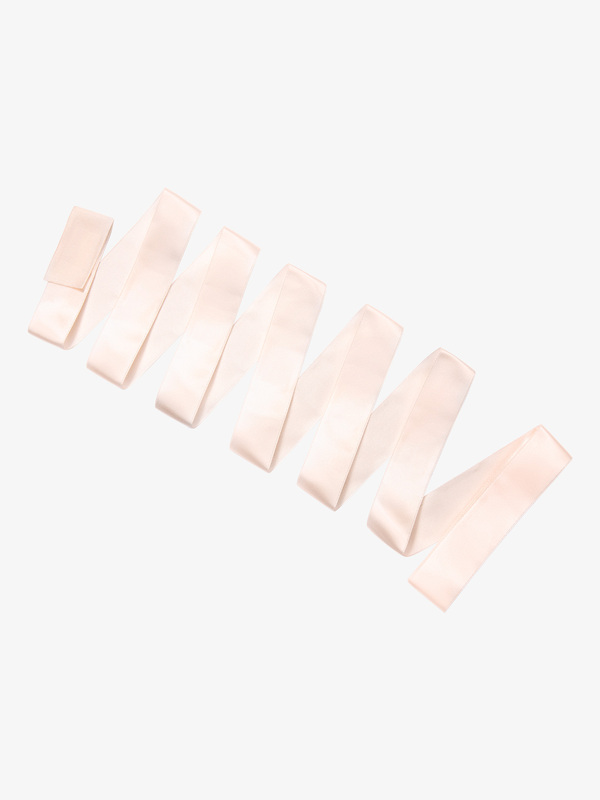 These pointe shoe ribbons are great! They match Grishko, Sansha, Capezio, Russian, and Gaynor Minden Pointe shoes perfectly (I have tried all of these types). The satin is high quality and stays tied. However, make sure to burn the ends before sewing the ribbons because they will fray. This is a great product that I would definitely reccomend. I use the Grishko ribbons because they are the only ones available at ,y local dance store. Now I know why! These ribbons are amazing! Their color matches every type of pointe shoes I've ever gotten-- from Russian Pointe to Capezio, these ribbons won't let you down! You MUST burn the edges or else they will fray. In addition, you have to be careful when you sew them because they will leave holes where you took the needle out when the needle is too big. But overall, these are the only ribbons I'll ever use! As long as you don't forget to either use clear nail polish on the ends or carefully burn the ends they work great! I am a beginner on pointe and these ribbons have worked very well so far. While I haven't been using them everyday, they have so far held up very well and are quite durable. Some classmates complained about them fraying...yet I singed both ends before sewing them on and have not had ANY problems with fraying. The color (almost a pastel peach) and texture are also very nice. They match perfectly with my Gaynor Minden pointe shoes. Awesome product by Grishko, yet again! I have been using these ever since I got on toe and I LOVE them!!! They are soft and the knots don't come out when dancing! Every time i tie my pointe shoes with this ribbon the knot always slips and comes undone. These honestly may have been the best pointe shoe ribbons I have ever had. i think they are just perfect, because they don;t become lose at all. Sadly, I have Capezio pointe shoes, so I can't really buy the Grishko ribbon anymore, because of the difference in the colors. If you have a pointe shoe similar to the Grishko pointe shoes, I would full-heartedly recommend these ribbons. Best Ribbons i have ever had! Since I am required to have ribbons on my pointe shoes (of course!!) AND my flat shoes, I had to find a ribbon that i could stick to. These are so light weight. but when i was burning these, they almost went up in flames! So just be careful when burning the edges! Good product, a little thin. Very nice ribbons, the do fray a little and are pretty thin.... but they work very well. I have Grishko pointe shoes so it's a pretty good match in color. I was overjoyed when I found these! The other ribbons all seemed thin and cheaply made. They were also a very strange orange/pink color which doesn't work with most pointe shoes. These Grishko ribbons are durable and a very pretty shade of pink. The color especially works well with Russian Pointe and Grishko pointe shoes. I would recommend these to anyone and everyone. I have the Grishko 2007 and I bought these because my friends say they work great. They are soft, but they fray way to much, even after I burned the tips. They started fraying the second I took them out of the package, and when I went to sew them, it had already started fraying. I just sewed it a few cm above the frayed part but after like 2 or 3 classes it had frayed up to the stitch and now i have had to resew it twice. they are pretty and soft, but very cheap material and not very comfy either. I don't recommend these. I use this ribbon for my pointe shoes, and they are very nice and work well. I love these ribbons. They are great. Make sure you burn the edges though. :) I love them. They go very good with my pointe shoes which are the Heritage. They are perfect! They go great with Grishko 2007s, too! I have so far, only used these ribbons. I will keep using them. They fray easily but still GREAT! I am, by the way, 11 and a beginner pointe student. I recommend these ribbons. This ribbon is the one that all my teachers recommend. We have been wearing it ever since we got on pointe. It has worked fabulously! I like the color, and it matches well with Grishkos. It's pretty soft, and it ties well. It's very pretty and tough but when I'm rolling up thru demi-pointe, the edges of the ribbon cut into my ankles! I've started using Capezio ribbon on my Grishkos and they match very well. This is very pretty ribbon, and it looks really nice, but I've found that it doesn't hold a knot very well. Partway throughout class I have to stop and re-tie my ribbons, since they've loosened. Otherwise very nice, classic, and pretty. If you're going to use shiny ribbon, you might as well buy these!